Don’t let your old or broken cubicles or office furniture simply be thrown out or cast aside, instead have the professionals at Business Environments repair your office furniture. We have over 30 years of experience in the office furniture industry, let us show you show we have built a reputation for being one of the most professional family-owned and -operated office furniture service companies in the industry. When you turn to us for a cubicle repair, our team of technicians will perform modifications to any of your existing workstations to touch-up and repair or replace any broken pieces. 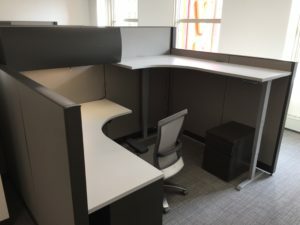 Much of the time, torn fabric or a disconnected panel doesn’t mean you’re going to need a new cube, our team will expertly reassemble your cubicle after performing any necessary repairs so that your cubicles are installed good as new. Additionally, we are even able to perform touch-ups and repairs on damaged wood furniture, executive desks, chairs, and more. The team at Business Environments is able to handle much more than just a cubicle repair project if you desire it. We are highly trained in all aspects of office furniture installation and repair and we can help you with furniture reconfigurations, relocations, liquidations, space planning, and warehousing and inventory management. Each office furniture installation or repair project begins by assigning you a dedicated project manager, who will oversee your project every step of the way. This single point-of-contact will put together your estimate, manage schedules, and keep you up-to-date on the daily progress of your project. 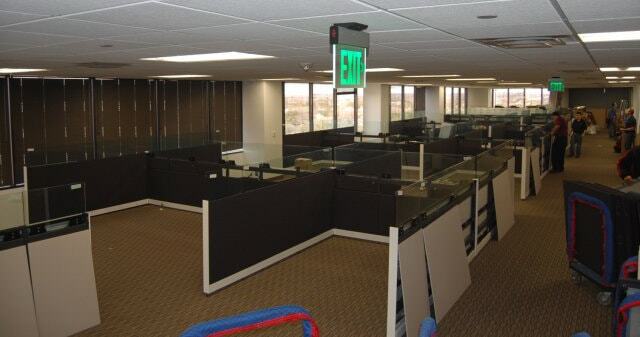 To learn more about our cubicle repair and inventory management services, please contact Business Environments today. One of our knowledgeable team members will happily answer any questions you may have.